"Hampton hotels have a rich history in providing quality accommodations to our guests," said Marsheila Runnels, general manager. "We are confident our latest renovations exemplify the highest Hampton standards and what our guests expect from our brand." Baywood Hotels announces the completion of its $1.25 million renovation project to the property. As part of the renovation, changes were made to: the hotel lobby which features new breakfast space with community table with outlet access, additional sofa seating, new tables and chairs, new tile and carpet, and a new business center. Additional public space renovation was completed in the hotel’s pool/hot tub area, which features new pool tile decking and table and chairs, and a brand new fitness center with upgraded elliptical, treadmill, and yoga mats, and a balance ball. In addition to the public area, Guest Rooms went under complete renovation with new features such as pillow top mattress, carpeting, wallpaper, lighting package, sofa seating , and desk with Ergonomic chair. The guest bathrooms also went through a refresh with a shower/tub surround, tile floor, quartz countertop, undermount sink, and new light package and mirror. The hotel now features elements of the new forever young initiative (fyi) designed to provide guests with accommodations that are multi-functional, modern, convenient and comfortable. fyi helps to extend the life of high-performing properties by upgrading indoor and outdoor design elements, applies innovative thinking to new prototypes and complements current initiatives like the Perfect Mix Lobby and fitness center. The 76-room property, located at 1400 Village West Parkway, Kansas City, Kansas 66111 is managed by Baywood Hotels. The newly renovated hotel is in the center of Kansas Speedway, Children’s Mercy Soccer Stadium, Hollywood Casino, and walking distance to shopping and restaurants. In addition to the renovated areas, Hampton Inn Kansas City-Village West offers such amenities as a 24-hour business center with complimentary printing, free Wi-Fi and free hot breakfast. 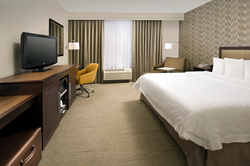 Guestrooms are equipped with the brand’s signature Clean and fresh Hampton bed®, microwave and coffeemaker. Hampton Inn Kansas City-Village West participates in Hilton HHonors®, the only hotel loyalty program that allows members to earn Points & Miles® on the same stay and No Blackout Dates on reward stays. HHonors members always get our lowest price with our Best Price Guarantee, along with HHonors Points, digital check-in and no booking fees only when they book directly through Hilton. For more information or to make reservations, please visit the hotel’s website or call 1-(910) 328-1400. Read more about Hampton by Hilton at http://www.hampton.com. Established in 1975, Baywood Hotels, Inc. is a fast-growing and privately-owned hospitality management company, operating over $800 million in assets and employing over 1,000 associates nationwide. The company is headquartered in Greenbelt, Maryland, and has regional offices in Chantilly, VA, Miami, FL and San Antonio, TX. In each of its regions, the private hotel ownership company is consistently recognized as an innovative leader in the hotel industry, focusing on product concept and development and the outstanding management of its assets. The focused vision, strong values and aggressive long-range strategy of Baywood Hotels has helped the company develop reputable and well-branded hotels in areas where Baywood has competitive expertise and partnerships. Baywood Hotels’ portfolio includes well-known brands, such as Marriott, Hilton and InterContinental Hotels Group, as well as several independent brands. Baywood Hotels employs over 1,000 associates nationwide. visit BaywoodHotels.com. Find us on Twitter http://www.twitter.com/BaywoodHotels or Facebook https://www.Facebook.com/Baywood-Hotels-121881884519200/.